Scientists may have found the explanation on how a magnetar is formed. Magnetars are a a type of neutron star and have a very strong magnetic field. During a supernova explosion, stars collapse and form either a neutron star or a black hole. Neutron stars are so dense that a teaspoon of its material may weigh over a billion tons. One such type of neutron star is a magnetar. 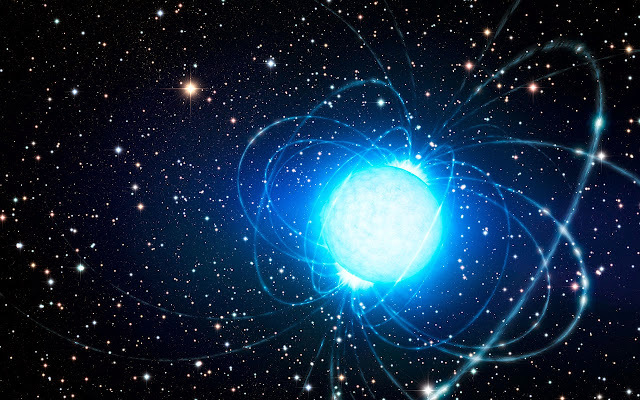 Magnetars are the strongest magnets known in the Universe. They are millions of times more powerful than the strongest magnets on Earth. Scientists have long believed that magnetars are formed through the interactions of two massive stars that orbit each other in a very tight binary system; an orbit comparable to the distance of the Earth to the Sun. The theory suggests that the mass transfer between the two stars created a rapid rotation of one star which resulted in a very strong magnetic field. A second mass transfer slimmed down that star to it doesn't collapse into a black hole at the moment of its death. Without finding a companion star, this theory was hard to prove. They further suggested that the companion star may have been thrown out of orbit during the supernova explosion; a runaway star. With the magnetar found in the star cluster Westerlund 1, the theory may have sound basis as scientists discovered a runaway star, Westerlund 1-5, that could have been the partner star of the magnetar and aided in its formation. Magnetars are the bizarre super-dense remnants of supernova explosions. They are the strongest magnets known in the Universe — millions of times more powerful than the strongest magnets on Earth. A team of European astronomers using ESO’s Very Large Telescope (VLT) now believe they’ve found the partner star of a magnetar for the first time. This discovery helps to explain how magnetars form — a conundrum dating back 35 years — and why this particular star didn’t collapse into a black hole as astronomers would expect. When a massive star collapses under its own gravity during a supernova explosion it forms either a neutron star or black hole. Magnetars are an unusual and very exotic form of neutron star. Like all of these strange objects they are tiny and extraordinarily dense — a teaspoon of neutron star material would have a mass of about a billion tonnes — but they also have extremely powerful magnetic fields. Magnetar surfaces release vast quantities of gamma rays when they undergo a sudden adjustment known as a starquake as a result of the huge stresses in their crusts. The Westerlund 1 star cluster, located 16 000 light-years away in the southern constellation of Ara (the Altar), hosts one of the two dozen magnetars known in the Milky Way. It is called CXOU J164710.2-455216 and it has greatly puzzled astronomers. “In our earlier work we showed that the magnetar in the cluster Westerlund 1 must have been born in the explosive death of a star about 40 times as massive as the Sun. But this presents its own problem, since stars this massive are expected to collapse to form black holes after their deaths, not neutron stars. We did not understand how it could have become a magnetar,” says Simon Clark, lead author of the paper reporting these results. Astronomers proposed a solution to this mystery. They suggested that the magnetar formed through the interactions of two very massive stars orbiting one another in a binary system so compact that it would fit within the orbit of the Earth around the Sun. But, up to now, no companion star was detected at the location of the magnetar in Westerlund 1, so astronomers used the VLT to search for it in other parts of the cluster. They hunted for runaway stars — objects escaping the cluster at high velocities — that might have been kicked out of orbit by the supernova explosion that formed the magnetar. One star, known as Westerlund 1-5, was found to be doing just that. “Not only does this star have the high velocity expected if it is recoiling from a supernova explosion, but the combination of its low mass, high luminosity and carbon-rich composition appear impossible to replicate in a single star — a smoking gun that shows it must have originally formed with a binary companion,” adds Ben Ritchie (Open University), a co-author on the new paper. This discovery allowed the astronomers to reconstruct the stellar life story that permitted the magnetar to form, in place of the expected black hole. In the first stage of this process, the more massive star of the pair begins to run out of fuel, transferring its outer layers to its less massive companion — which is destined to become the magnetar — causing it to rotate more and more quickly. This rapid rotation appears to be the essential ingredient in the formation of the magnetar’s ultra-strong magnetic field. In the second stage, as a result of this mass transfer, the companion itself becomes so massive that it in turn sheds a large amount of its recently gained mass. Much of this mass is lost but some is passed back to the original star that we still see shining today as Westerlund 1-5. “It is this process of swapping material that has imparted the unique chemical signature to Westerlund 1-5 and allowed the mass of its companion to shrink to low enough levels that a magnetar was born instead of a black hole — a game of stellar pass-the-parcel with cosmic consequences!” concludes team member Francisco Najarro (Centro de Astrobiología, Spain). It seems that being a component of a double star may therefore be an essential ingredient in the recipe for forming a magnetar. The rapid rotation created by mass transfer between the two stars appears necessary to generate the ultra-strong magnetic field and then a second mass transfer phase allows the magnetar-to-be to slim down sufficiently so that it does not collapse into a black hole at the moment of its death.